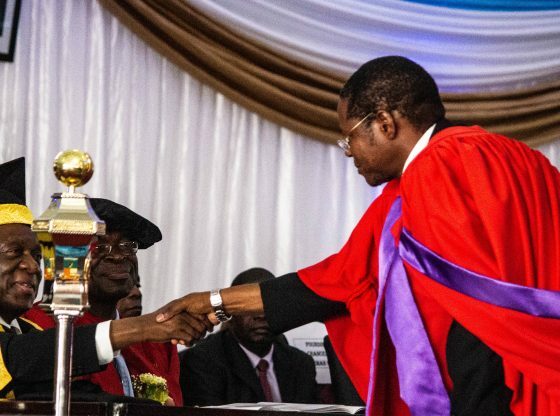 His Excellency, the President of the Republic of Zimbabwe, and Chancellor of the Midlands State University, Cde Emmerson D. Mnangagwa conferred degrees to 3757 graduates during the 18th Congregation of the Midlands State University Graduation Ceremony held at the University’s Gweru Main Campus on Friday the 23rd of November 2018. Speaking during the graduation ceremony, the Midlands State University Vice-Chancellor, Professor Victor N. Muzvidziwa said, the institution continues to strive to become an entrepreneurial University that is committed to producing well-rounded and holistic graduates well-suited for the ever-changing global village. ‘We strive to produce well rounded, holistic and versatile innovators who are eager to play a meaningful role in the socio-economic transformation of Zimbabwe. Thus our graduates possess the requisite academic and soft skills,’ he said. In its continued pursuit of excellence in teaching and quality research, Midlands State University has set up a quality assurance directorate and invested heavily in research. Increased research activity has seen the institution of higher learning being awarded several research grants. Distinguished grants secured by the University include the Precise, Royal Academy of Engineering, Grant Challenges Road-MApp and CODESRIA, PhosAgro/UNESCO/IUPAC grants among others. On the internationalization front, the University has also made significant inroads on the continent, moving 74 places up in 2018 on the African universities rankings according to the Webometrics ranking. Out of the graduating total, 1979 were female and 1778 male, with 4 graduating with PhDs, 458 masters degrees and 3295 honours degrees. The 2018 graduation ceremony was graced by various guests among them the Vice-President, Honourable Rtd General Dr Constantino G. D. N. Chiwenga, Minister of Higher and Tertiary Education, Science and Technology Development, Professor Amon Murwira, Minister of State for Provincial Affairs in the Midlands Province, Honourable Larry Mavima and the Minister of Local Government, Public Works and National Housing, Honourable July Moyo.